Park, Sung Goon Kim, Boyoung and Sung, Hyung Jin 2017. Hydrodynamics of a self-propelled flexible fin near the ground. Physics of Fluids, Vol. 29, Issue. 5, p. 051902. Park, Sung Goon Kim, Boyoung and Sung, Hyung Jin 2016. Self-propelled flexible fin in the wake of a circular cylinder. Physics of Fluids, Vol. 28, Issue. 11, p. 111902. Schooling behaviours among self-propelled animals can benefit propulsion. Inspired by the schooling behaviours of swimming jellyfish, flexible bodies that self-propel through a paddling-based motion were modelled in a tandem configuration. This present study explored the hydrodynamic patterns generated by the interactions between two flexible bodies and the surrounding fluid in the framework of the penalty immersed boundary method. The hydrodynamic patterns produced in the wake revealed flow-mediated interactions between two tandem propulsors, including vortex–vortex and vortex–body interactions. Two tandem flexible propulsors paddling with identical amplitude and frequency produced stable configurations as a result of the flow-mediated interactions. Both the upstream and downstream propulsors benefited from the tandem configuration in terms of the locomotion velocity and the cost, compared with an isolated propulsion system. The interactions were examined as a function of the initial gap distance and the phase difference in the paddling frequency. The equilibrium gap distance between two propulsors remained constant, regardless of the initial gap distance, although it did depend on the phase difference in the paddling frequency. Alben, S. & Shelley, M. 2005 Coherent locomotion as an attracting state for a free flapping body. Proc. Natl Acad. Sci. USA 102, 11163–11166. Borazjani, I. 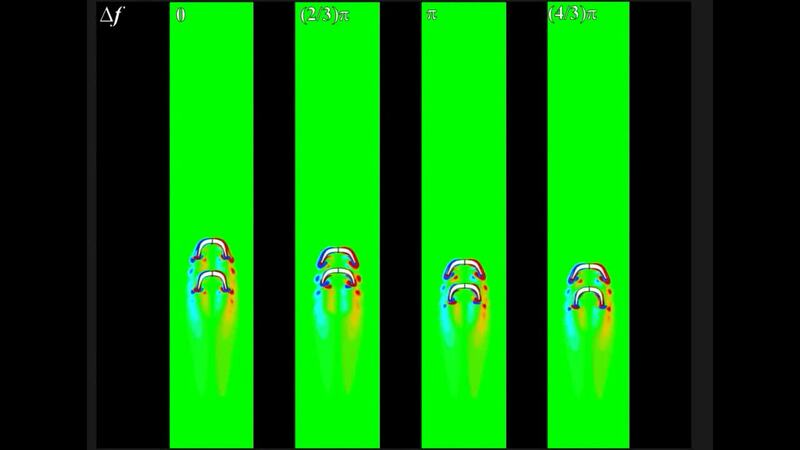 2015 Simulations of unsteady aquatic locomotion: from unsteadiness in straight-line swimming to fast-starts. Integr. Compar. Biol. 55, 740–752. Breder, C. M. Jr 1976 Fish schools as operational structures. Fish. Bull. 74, 471–502. Colin, S. P. & Costello, J. H. 2002 Morphology, swimming performance and propulsive mode of six co-occurring hydromedusae. J. Expl Biol. 2002, 427–437. Dabiri, J. O. 2005 On the estimation of swimming and flying forces from wake measurements. J. Expl Biol. 208, 3519–3532. Dabiri, J. O. 2009 Optimal vortex formation as a unifying principle in biological propulsion. Annu. Rev. Fluid Mech. 41, 17–33. Dabiri, J. O., Colin, S. P., Costello, J. H. & Gharib, M. 2005 Flow patterns generated by oblate medusa jellyfish: field measurements and laboratory analyses. J. Expl Biol. 208, 1257–1265. Daghooghi, M. & Borazjani, I. 2015 The hydrodynamic advantages of synchronized swimming in a rectangular pattern. Bioinspir. Biomim. 10, 056018. Gemmell, B. J., Costello, J. H., Colin, S. P., Stewart, C. J., Dabiri, J. O., Tafti, D. & Priya, S. 2013 Passive energy recapture in jellyfish contributes to propulsive advantage over other metazoans. Proc. Natl Acad. Sci. USA 110, 17904–17909. Graham, W. M., Pages, F. & Hamner, W. M. 2001 A physical context for gelatinous zooplankton aggregations: a review. Hydrobiologia 451, 199–212. Huang, W.-X. & Sung, H. J. 2009 An immersed boundary method for fluid–flexible structure interaction. Comput. Meth. Appl. Mech. Engng 198, 2650–2661. Jang, S. J., Sung, H. J. & Krogstad, P. 2011 Effects of an axisymmetric contraction on a turbulent pipe flow. J. Fluid Mech. 687, 376–403. Kim, K., Baek, S. J. & Sung, H. J. 2002 An implicit velocity decoupling procedure for incompressible Navier–Stokes equations. Intl J. Numer. Meth. Fluids 38, 125–138. Lauder, G. V. & Jayne, B. C. 1996 Pectoral fin locomotion in fishes: testing drag-based models using three-dimensional kinematics. Am. Zool. 36, 567–581. Liao, J. C., Beal, D. N., Lauder, G. V. & Triantafyllou, M. S. 2003a Fish exploiting vortices decrease muscle activity. Science 302, 1566–1569. Liao, J. C., Beal, D. N., Lauder, G. V. & Triantafyllou, M. S. 2003b The Karman gait: novel body kinematics of rainbow trout swimming in a vortex street. J. Expl Biol. 206, 1059–1073. Linden, P. F. & Turner, J. S. 2004 ‘Optimal’ vortex rings and aquatic propulsion mechanisms. Proc. R. Soc. Lond. B 271, 647–653. Mchenry, M. J. & Jed, J. 2003 The ontogenetic scaling of hydrodynamics and swimming performance in jellyfish (Aurelia aurita). J. Expl Biol. 206, 4125–4137. Megill, W. M.2002 The biomechanics of jellyfish swimming. PhD thesis, The University of British Columbia. Muller, U. K., van den Heuvel, B. L. E., Stamhuis, E. J. & Videler, J. J. 1997 Fish foot prints: morphology and energetics of the wake behind a continuously swimming mullet (Chelon labrosus Risso). J. Expl Biol. 200, 2893–2906. Park, S. G., Chang, C. B., Huang, W. H. & Sung, H. J. 2014 Simulation of swimming oblate jellyfish with a paddling-based locomotion. J. Fluid Mech. 748, 731–755. Rottini Sandrini, L., Stravisi, J. & Pieri, G. 1980 A recent shift in the wind distribution and the appearance of unusual planktonic organisms in the Gulf of Trieste. Boll. Soc. Adr. Sci Trieste 64, 77–84. Sahin, M. & Mohseni, K. 2009 An arbitrary Lagrangian–Eulerian formulation for the numerical simulation of flow patterns generated by the hydromedusa Aequorea victoria . J. Comput. Phys. 228, 4588–4605. Sahin, M., Mohseni, K. & Colin, S. P. 2009 The numerical comparison of flow patterns and propulsive performances for the hydromedusae Sarsia tubulosa and Aequorea victoria . J. Expl Biol. 212, 2656–2667. Tytell, E. D. & Lauder, G. V. 2004 The hydrodynamics of eel swimming. I. Wake structure. J. Expl Biol. 207, 1825–1841. Ulrike, K. M. 2003 Fish ’n flag. Science 302, 1511–1512. Zavodnik, D. 1987 Spatial aggregations of the swarming jellyfish Pelagia noctiluca (Scyphozoa). Mar. Biol. 94, 265–269. Zhao, H., Freund, J. B. & Moser, R. D. 2008 A fixed-mesh method for incompressible fluid–structure systems with finite solid deformations. J. Comput. Phys. 227, 3114–3140. Zhu, X., He, G. & Zhang, X. 2014 Flow-mediated interactions between two self-propelled flapping filaments in tandem configuration. Phys. Rev. Lett. 113, 238105. Locomotions of flexible propulsors as a function of the phase difference of the flapping frequency.